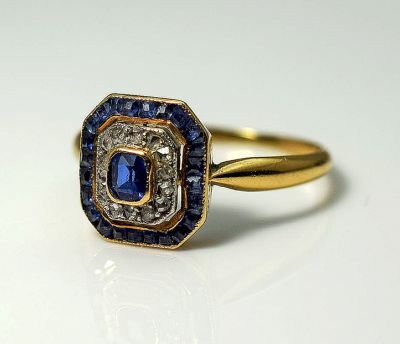 A beautiful Edwardian 18kt yellow and white gold mill grain ring featuring 1 emerald cut medium blue sapphire, est. 0.26ct; 24 caliber cut medium blue sapphires, est. 0.64ct and 14 rose cut diamonds, est. 0.14ct (Si-I clarity & G-H colour). The gemstones exhibit wear consistent with the age of the ring.